Apologies for the uninspired, SEO-optimized title. 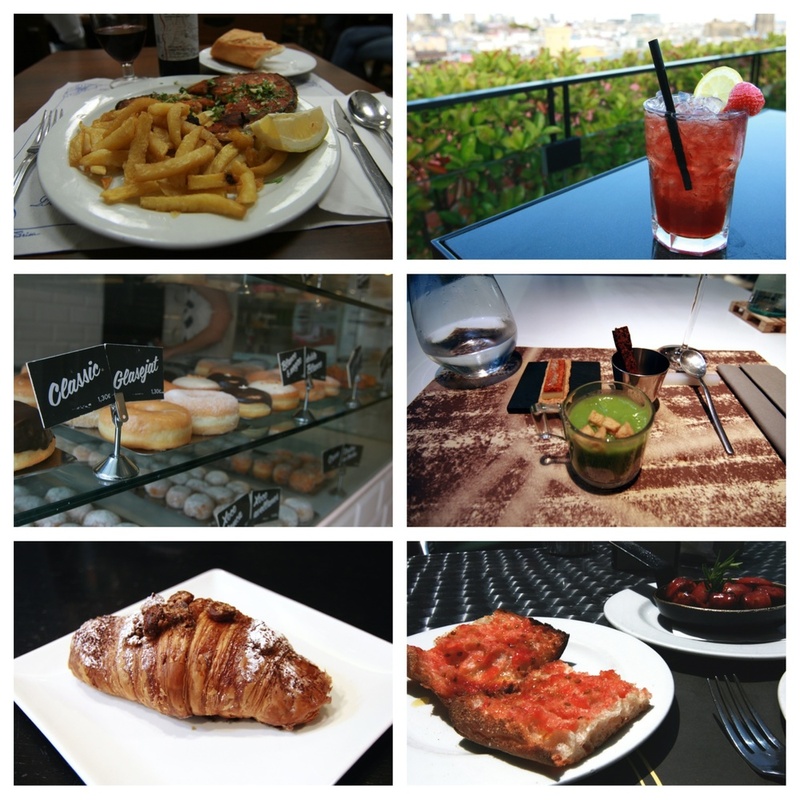 But since Barcelona is, gastronomically speaking, much more interesting than anywhere I visited in Portugal, I just had to keep track of all the places I went to and had yummy things. Because after all, what's a chef to do in a new city other than eat? The following was curated from personal recommendations from friends as well as a few websites that I follow and trust. Got any to add? Let me know! 1. Romesco. Carrer de Sant Pau, 28. (It's actually around the corner from #28 on a tiny side street that's unnamed on Google Maps). Hidden away from all the touristy tapas restaurants that line La Rambla, this is pretty much a tiny Spanish diner that serves hearty, simple meals for under 10€. 2. Hotel 1898. La Rambla, 109. Rooftop bars are notoriously exclusive, but if you stride through the lobby with confidence and ride the elevator (hint: the lift on the far right is the only one that goes to the roof) up to the 7th floor, you will be rewarded with a lovely view and comfy couches and fleece blankets on the swanky terrace. 3. LUKUMAS. Carrer del Torrent de l'Olla, 169. 4. EspaiSucre. Carrer de la Princesa, 53. I could probably dedicate an entire post to this dessert-only restaurant that doubles as a culinary school but I'll try to keep it short. Food-wise you can select from a variety of tasting menus or be lame and just eat sweet tapas. I went for tasting menu 1. And it was easily one of the best dining experiences I've ever had. Reserve a table ahead online because the dining room isn't very large. 5. Bubó. Carrer Caputxes, 6. A pâtisserie to rival those in Paris. I went around breakfast time and had the gianduja croissant (filled with chocolate hazelnut and topped with caramelized nuts), but my chef friends tell me their chocolates and cakes are also good. 6. Casa Delfin. Passeig del Born, 36. I couldn't leave Barcelona without trying some tapas, but since this is the only place I tried I don't have anything to compare it to. No complaints about the food though! 7. La Taqueria. Passeig Font, 5. (Not pictured, because it was rather dark inside). I never found any decent Mexican food in Paris (I swear it's impossible to get anything spicy in that city), so I was quite pleased when I found this little hole-in-the-wall. Portions are a bit small for the price, but the quality and flavor make up for it. Located just a stone's throw from the Sagrada Familia, you can do as I did and reward yourself with chicken tacos after braving the crowds at the church.